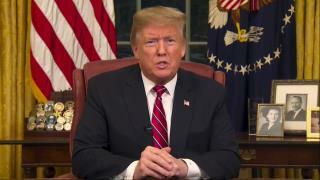 (Newser) – President Trump called the situation at the US-Mexico border a "humanitarian crisis, a crisis of the heart and a crisis of the soul" in a national address Tuesday night—but he stopped short of declaring a formal emergency in order to get a border wall built. In his brief speech, the president again called for $5.7 billion to build a wall, which he said would actually be a "steel barrier," reports Politico. In a quick rebuttal, Nancy Pelosi accused Trump of "manufacturing a crisis" at the border, per the AP, and she and Chuck Schumer reiterated that Democrats would not pay for any such barrier. The president, meanwhile, maintained that the wall "would quickly pay for itself," arguing that its cost would "indirectly" be covered by savings from the new trade pact with Mexico. It's called a "Presidential address to the people of the nation". Why should other persons get to speak? They aren't presidents! why is ok for Israel to have a wall but not America Chucky Schumer???? On CNN, contributor Carl Bernstein said: "I think we need to identify the real national emergency in this country and that is the question of whether or not Donald Trump is fit to be the president of the United States." Ahhahahahaghaa ~~ Right. So basically they’re just pissed still because he won the election. Open borders are for the birds.